Shallow water coastal habitats are delicate ecosystems that are particularly susceptible to imbalances. A healthy coastal ecosystem is composed of a diversity of species that do not negatively impact each other, and that interact and contribute to produce a beneficial habitat for all members of the community. Tunicates are marine invertebrate filter feeding organisms (also called sea squirts or ascidians) that are found primarily on hard substrate (rock, clam shells, docks, boat hulls, moorings), but are increasingly found on marine vegetation. Their abundance can negatively impact eelgrass habitat, including eelgrass and biologic members of the eelgrass meadow community. As tunicate species grow and spread, they tend to completely cover the substrate on which they are growing to the detriment of other organisms competing for the same space and food (Carman and Grunden 2010). Their coverage on the leaf surface of vegetation impedes photosynthesis and excessive fouling of eelgrass by tunicates can lead to shoot mortality (Wong and Vercaemer 2012). In August 2017, we (GPF staff members, and myself) conducted standard eelgrass-tunicate surveys at Slough Cove and Mid-Beach in EGP. Ten random quadrat (25 cm x 25 cm) samples were collected at each site. 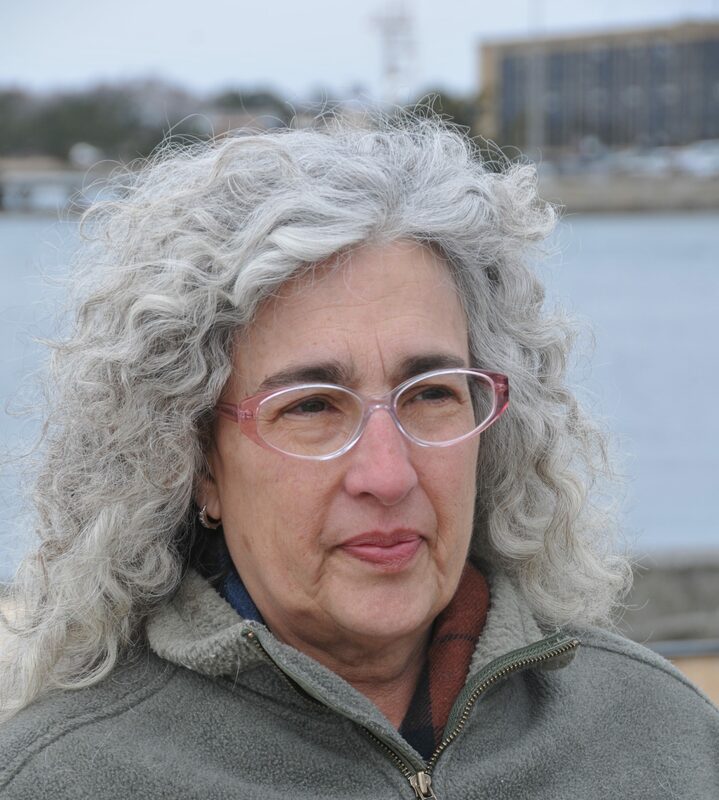 Results of the surveys indicate that, a) the canopy height, a standard measure of eelgrass health, of the eelgrass at Slough Cove and Mid-Beach was consistent with eelgrass elsewhere on Martha’s Vineyard and considered healthy by EPA standards, b) the eelgrass density ranged from 0-15 shoots/quadrat at Slough Cove (average of 8 shoots/quadrat) and, c) the eelgrass density ranged from 0-25 shoots/quadrat at Mid-Beach (average of 13 shoots/quadrat). The EPA standard for New England eelgrass density is 13 shoots/quadrat (25cm x 25cm) (P. Colarusso, pers comm). The density of the eelgrass at Slough Cove is not ideal but is more ideal at Mid-Beach. 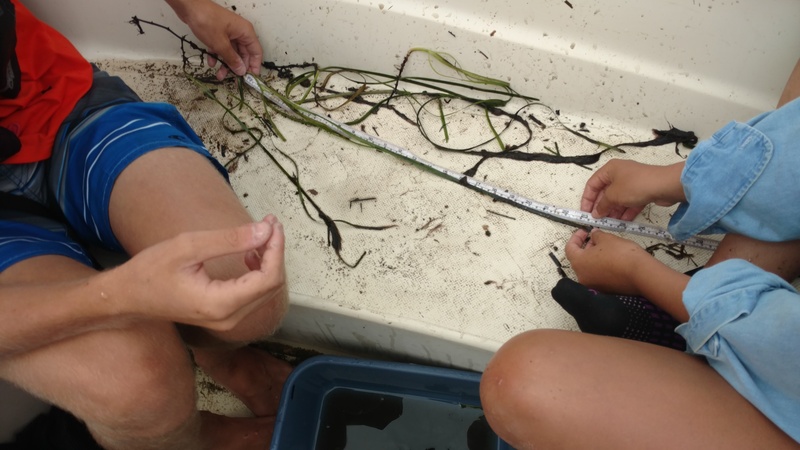 GPF staff measuring eelgrass blade length, a standard indicator of eelgrass health. Our results also showed that tunicate diversity in both EGP surveys was limited to one species, native Molgula manhattensis. Tunicate density on eelgrass ranged from 0-420 individuals/quadrat at Slough Cove to 0-25 individuals/quadrat at Mid-Beach. Molgula was also common on nearby artificial substrates. Water quality was better at the Mid-Beach site, and thus the probable reason for why the eelgrass density was greater there. Further, the better water quality at Mid-Beach may explain why the tunicate population was less dense at that site, but this is unknown. We will begin to examine this potential relationship summer 2018, through our work funded by an Edey Foundation grant. EGP eelgrass density, tunicate diversity, and tunicate density are similar to other marine ponds on Martha’s Vineyard but yet different. For example, Farm Pond in Oak Bluffs has an eelgrass density average of 14 shoots/quadrat (similar to Mid-Beach). Tunicate diversity on eelgrass in Farm Pond is limited to the same species, M. manhattensis (similar to EGP). But there is a difference in the seasonality of the tunicate density. Molgula is abundant in early summer in Farm Pond (400 individuals/quadrat), but by August, they are almost absent (3 individuals/quadrat. 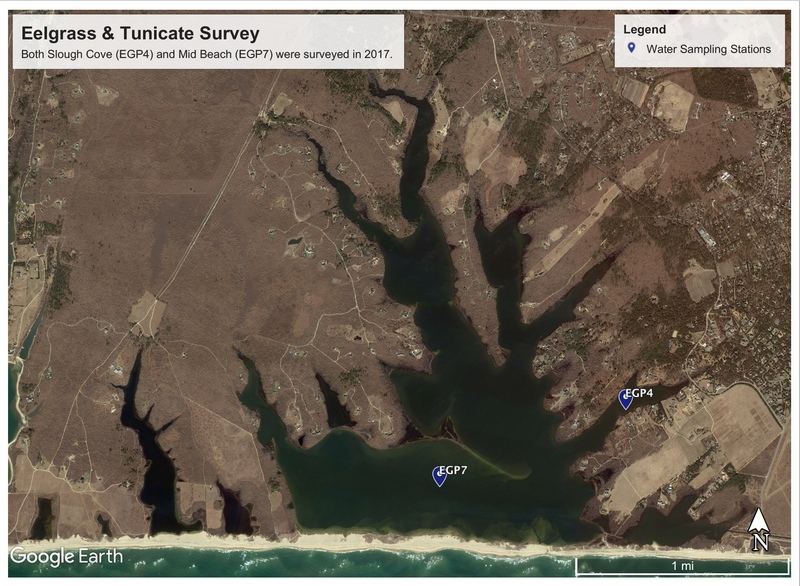 Based on the results of our eelgrass-tunicate surveys, it appears that areas of EGP represent an ecosystem that is out of balance. The excessive density of tunicates on eelgrass in EGP in August is alarming, especially at Slough Cove. Molgula is considered a fouling species, often seen in New England coastal habitats, including at harbors, aquaculture sites, and eelgrass meadows but, while an abundance of Molgula is common elsewhere on Martha’s Vineyard, such as at Farm Pond, it is only during the early summer. Molgulids become rare by August (Carman et al. 2016). This is not the case in EGP, particularly at Slough Cove. Predation probably plays a role in reducing the tunicate populations in many coastal habitats, including Farm Pond (Carman et al. 2016). To see if local, large crab species would consume Molgula, Dave Grunden, Oak Bluffs Shellfish Constable, and I conducted a series of exploratory experiments at the Martha’s Vineyard Shellfish Group laboratory on Lagoon Pond. In August 2017, Molgulas used in the study were collected from eelgrass in EGP and transported to the laboratory (Emily made the arrangements) and crabs were collected in crab traps in Lagoon Pond. Our results indicate that green crabs Carcinus maenas will display no feeding activity on Molbula, while spider crabs Libinia dubia, will readily consume Molgula. A single L. dubia can consume at least 30 individual molgulids in a 24-hour period (Carman et al., ms in prep). We do not know the extent of the crab population in EGP, but because of these encouraging results, we hope to do spider crab surveys and experiments in EGP in the near future. Eelgrass growth is predominantly controlled by available light (Dennison and Alberte 1985). During peak growth periods, eelgrass will lose and replace leaves in several days to a week (Duarte 1991). This rapid turnover of leaves helps the plant control epiphytic growth, including the colonization by tunicates. As day length declines later in the summer into the fall, the leaf turnover rate declines. Late in the fall, eelgrass will shed much of its aboveground biomass (Colarusso et al. 2016). However, 1) if water temperatures are favorable for tunicate reproduction and growth (usually spring, summer, and fall), and 2) if there is excessive tunicate growth that encapsulates the plants, so that they cannot naturally shed their leaves and defoliate, and 3) if natural predators of tunicates such as spider crabs are lacking, then the impact of tunicates on eelgrass can be greatly negative. There may however be a positive impact. The relatively small tidal range and enclosed nature of EGP makes it susceptible to potential impacts from filter feeding activities of large number of tunicates. Curiously, the great abundance of Molgula in EGP may be helping to improve the water quality by filtering phytoplankton and bacteria out of the water. The potential impact of tunicates extends beyond the physical smothering of vegetation or hard substrate. Tunicates are industrious filter feeders, potentially filtering up to 10,000 ml/h (Fiala-Medioni 1978). Tunicate filtration rates can vary substantially with water temperature (Kjerulf Petersen and Riisgard 1992; Robbins 1983). The potential impact of large quantities of tunicates filtering large quantities of water is not yet understood. Further work should be done to test this potentially positive impact of tunicates on EGP water quality.